The Capitol Steps' show is rip-roaring political fun. The seven-member cast is a constant transition of new costumes, props, and music. 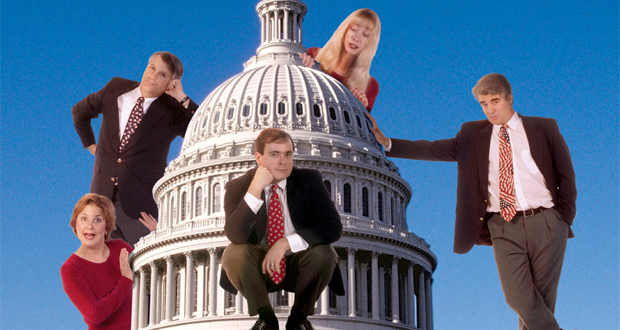 Their political satire song parodies take potshots at the outrageous goings-on in Washington. The Capitol Steps perform over 300 shows a year all over the country and frequently appear on television. Over the last 20 years, the group has performed off-broadway and produced 24 recordings, including their latest, Papa’s Got a Brand New Baghdad and such ditties as Between Iraq and A Hard Place, Osama Come Out, Tomorrow; Bill’s Way; Fools on the Hill; Son of a Bush; One Bush, Two Bush, Old Bush, New Bush; It’s Not Over Till the First Lady Sings! ; First Lady and the Tramp; Unzippin' My Doo-Dah and more. Why Book The Capitol Steps? "When I arrived at the hotel, the stage, props, etc were already in place. The folks on site was very friendly. We appreciate the fact that we were able to book this group at such a short notice. Through Eagles Talent Connection, all details were taken care of and all we had to do was enjoy, and that, we did!" "Our crowd loved the Capitol Steps once again! Their performance kept the laughs coming throughout the hour. What a very talented group and the bonus is that they are extremely easy to work with, very flexible, and pleasant. They are very self sufficient and seem to try hard not to make any demands on the harried event planner! (smile) Attendees can forget a lot about program content and speeches but for years they remember the entertainment!" "The Capitol Steps were fabulous! We had about 300 people and everyone loved them! The show was very relevant and kept up with current events. Our group was quite diverse and the Capitol Steps entertained everyone. They were also very easy to work with. I would absolutely recommend the Capitol Steps to anyone who is looking for a great show!" "The Capitol Steps delivered the most wonderful program for our fundraiser. We highly recommend them! They were quite a draw and we had many more attending our event because everyone was so anxious to have a fun experience." "You will not make a mistake when booking Capitol Steps to perform at your event. They are definitely entertaining, hilarious and a pleasure to work with. Our attendees continue to rave about them from previous performances!" "We recommend them highly. The information they provided for the set-up was excellent, and if you follow exactly, you won’t have any problems." ￼"The Capitol Steps was very entertaining. The whole show was vibrant and fun and lent an upbeat feel to the conference kickoff!"